In their 2016 Guidelines for Stroke Rehabilitation and Therapy, the American Heart Association and American Stroke Association call for a redesign in strategies to treat stroke, a devastating and costly health problem. A redesign is especially needed for development of therapies that target the upper limb. Mirrored Motion Works (MMW) is dedicated to meeting this need by incorporating a revolutionary new approach in the design of its rehabilitative devices. The approach combines video gaming, modern technology and a therapeutic method that links the movements of both arms in a mirrored manner to retrain the patient’s brain. It is an evidence-based, affordable path to progress (link to Research & Documentation). We present here the Bimanual Arm Trainer (BAT) – a medical device that uses our innovative approach to regain function in the upper back, shoulder and arm. The BAT will be followed by devices for the forearm, wrist and hand. Nine year old violinist suffers severe stroke but now plays again following therapy that included the Bimanual Arm Trainer (link to article). Mirrored Motion Works is proud to partner with the New York University Entrepreneurial Institute (please see video). Our mission is to create a new standard of care for physical rehabilitation of individuals who have asymmetric limb weakness (e.g following stroke). Mirrored Motion Works designs and markets innovative equipment that empowers patients to take charge of their own therapy, improve functional outcomes, and reduce our health care burden. Our feasibility study, presented at the Society of Neuroscience in 2015 and published in 2017, demonstrated that training with the Bimanual Arm Trainer reduced post-stroke synergy patterns, increased active range of motion and improved overall motor recovery. Learn more. The mirrored motion Bimanual Arm Trainer helps patients use their unaffected arms to facilitate movement in their affected arms. 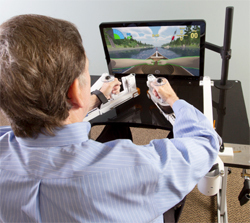 The device, which is compliant with Class 1A requirements of the FDA, is interfaced with video games to increase motivation and performance at the back, shoulder, and arm. 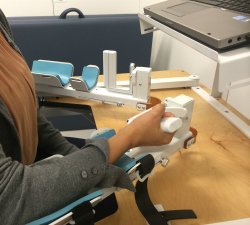 The mirrored motion Bimanual Arm Trainer is available for use in both in-patient and out-patient settings. We offer training and support services for patients, providers, therapists and medical professionals. Contact us to learn more. “Even after an acute rehab stay, patients still require a significant amount of assistance, which means we need a safer discharge plan. Our facility often doesn’t have enough therapy staff to accommodate all of our patients. 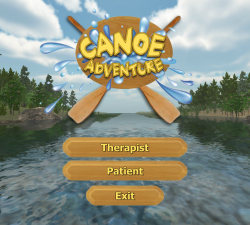 We really need new types of therapy devices... to help improve their outcome." Experience arm therapy that works and is fun to use. Take the lead in innovative stroke therapy. Our device is effective and affordable. Motivate your patients and see their performance improve. Copyright 2019, © Mirrored Motion Works, Inc.